After perfecting the easy method for book folding, I’ve now started experimenting with variations of a single pattern. This folded heart book shows the result of two variations on the original method for folding a book into a word or image. In both variations, I skip a page every few folds. Well, sort of. There is one variation where you fold three pages then fold the fourth page straight up and down a couple inches from the front. If you consider this fold one of the stripes in the pattern, then you don’t have to add any pages to the number on the pattern. But you could not consider it part of the pattern. In that case, you would have to add that many pages to the number on the pattern when looking for a book to fold. 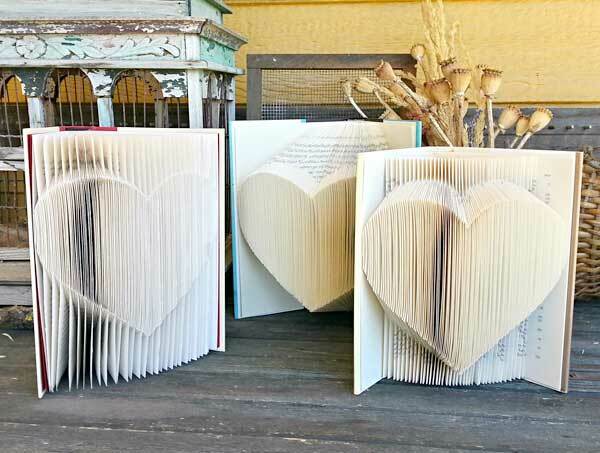 For example, this heart pattern uses a book with 320 pages. If I’m marking the skipped page on the pattern, then I still only need a book with 320 pages (that’s what I did in the one shown here). But if I’m folding three pages then “skipping” one page, I would add 107 pages for the final effect. That means I would need a book with 427 pages instead of 320. The same with the second variation. In this folded book I simply skipped a page after five folds. I did not fold the skipped page. Since for every five folds I need to add one more sheet of paper, I need to add 65 pages (320/5) to the final count. That equals a book with 385 pages. This video shows the 3 different way to fold this single pattern. You can buy this heart pattern from my Etsy shop for $2.99. Thank you so much for sharing. 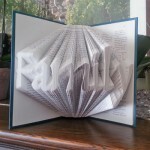 I’m going to try and design my own Book folds for ie H♡ME and L♡VE. Thanks for the insiration ?